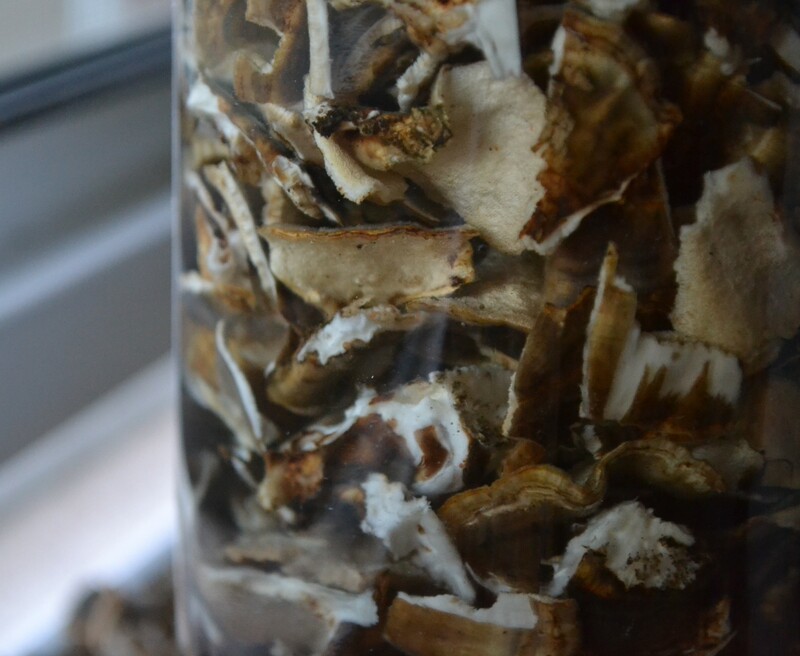 I already touched upon some of the details regarding the process of double extraction in my first post on foraging for wild medicinal mushrooms which you can check out right here. I decided to write a piece exclusively outlining this process because I find it to be particularly deserving of one. My original post focused on the anatomical features and other interesting facts surrounding the turkey tail (Trametes versicolor) species but double extractions can be made using many medicinal mushrooms or plant species. Here I am strictly going to limit myself to discussing the process of double extraction and why this method works so well for extracting the medicinal compounds found in the mushrooms and making them available for your body to metabolize and utilize. I also mentioned in my previous post that I was not going to go into the medicinal compounds found in Trametes versicolor (that are also likely found in other medicinal mushrooms) but feel that it may be beneficial to at least lightly graze the surface of this subject matter because I find it quite interesting and I am hoping that you will as well. It gives you more of an appreciation for the complexity of medicinal mushrooms and how much they have to offer. Regardless, I still encourage you to explore outside the confines of this website and check out the two links that I posted earlier in the year about various studies that have been conducted by different institutions around the world exploring the immense potential of medicinal mushrooms. Turkey tail mushrooms are one of the most thoroughly studied medicinal mushroom species in modern medicine, especially in Asia where the raw, dried form of the mushroom has been used for generations as an immune system stimulator and preventative cancer remedy. The fruiting bodies and even more so the mycelium itself have powerful anti-viral and anti-bacterial properties, discouraging countless pathogens and abnormalities which may result in the development of hepatitis C, liver cancer and cervical cancer among others. Tramates versicolor was also found to produce a powerful immune response, a property that was verified by various subsequent studies, which has the potential to assist cancer patients recover from chemotherapy or radiation treatment. The double extraction method involves steeping your medicinal mushrooms in alcohol for several weeks and then boiling those same mushrooms in an equal amount of water. Processing the mushrooms in alcohol and water allows for both the alcohol soluble and water soluble compounds to be extracted, for if you only boil the mushrooms in water or steep them in alcohol, you are only accessing the beneficial compounds that can be extracted from the mushrooms in that particular solvent. By soaking the mushrooms in alcohol for several weeks, then boiling those same mushroom pieces in equal parts water and mixing the two solutions together, you get an end product that contains the full range of accessible nutrients and medicinal compounds that also stores for very long periods of time. This allows you to have a ready made supply of medicine which can be taken on a daily basis for preventative measures or when ill. The ratio of dried mushrooms to alcohol and water is not consistent with the resources that I have been able to access on the subject, so a great deal of experimentation is likely going to be required to determine how strong you would like the final product to be. I came across one mushroom tea recipe that suggested boiling 10 grams of dried mushrooms in 16 ounces of water. Deciding that 16 ounces didn’t appear to be enough water, I double that to 32 ounces. After bringing the water to a boil and gently simmering the mushrooms for 2 hours, I removed the tea from the heat and allowed it to cool before straining it. It had a caramel color and a damp, mossy aroma. I would describe the taste as something worth acquiring: mildly bitter and earthy. Tastes exactly like good medicine should. Since the amount of mushrooms to solvents is quite variable, the yields of medicinal compounds in the resulting extraction will fluctuate a little bit between batches. As far as daily dosage goes, I have heard 2 tsp. 2 or 3 times a day as a tonic and immune system stimulant. I’m sure you could probably handle more, especially if you were sick and needed an extra boost, although drinking a wineglass full or more might be pushing it. Here is what I believe to be the most consistent and straight forward recipe. 3. Put container in a cool, dark place where the temperature doesn’t fluctuate. Disturb and shake the container daily for 3-4 weeks. 4. After 3-4 weeks, strain out the mushrooms while pouring the alcohol extract into a separate container. The alcohol by then should have taken on a dark brown color. 5. Bring water to a boil and add mushrooms. Simmer for 2 hours. 6. Allow decoction to cool before mixing with the alcohol extract. Stir to combine and store in a dark colored bottle in a cool, dark place. This extract will last for years, but should be consumed within the first year to maximize on potency and quality. Pro Tip: By facing the gills of the mushrooms upwards while they are drying, the concentrations of vitamin D in the mushroom tissue exponentially increases and remains high even after thorough drying. So if you want an extra vitamin boost from your mushroom extract, drying the mushrooms in bright but indirect sunlight with the gills of the caps facing upward is the way to go.